When purchasing a particular property, equipment, appliance, and most especially a vehicle, transactions like these often cost a lot of money. Maintaining them can also be costly for the customers and clients. Often, when purchasing new equipment or products, a warranty is provided by the business as a guarantee that maintenance contract services will be provided to ensure that these purchases will be maintained and repaired at no cost or at a lower price. This is when a maintenance contract is essential. 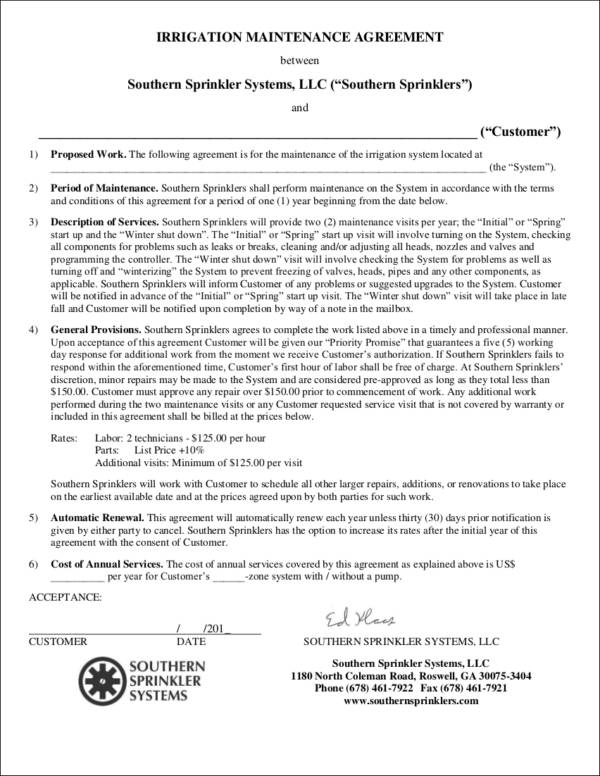 A maintenance contract is basically a sample agreement between the business and the consumer indicating that the business has agreed to maintain and repair any defects that the equipment, vehicle, or appliance may have. 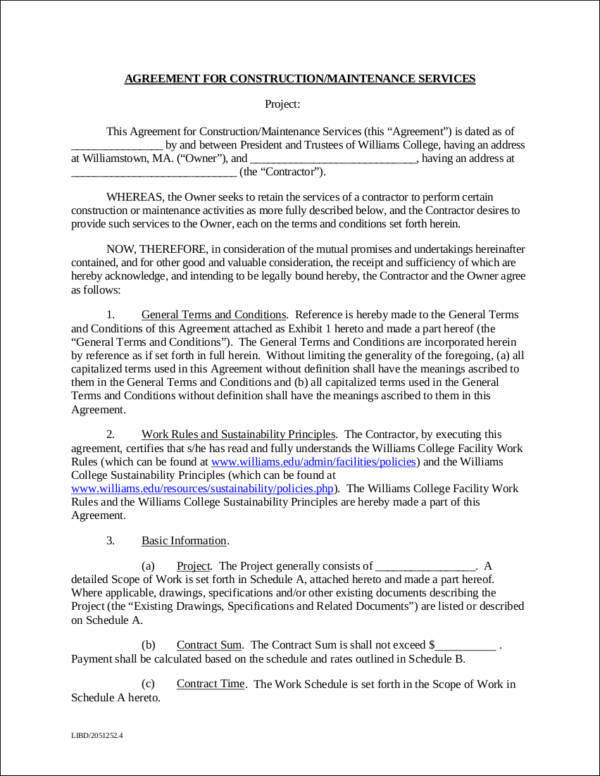 This agreement usually covers a specific period of time depending on what was the agreement between the two parties. Aside from the maintenance of equipment and appliances, a maintenance contract can also be used when a property owner needs to have his/her property maintained. A maintenance contract states the rights and responsibilities of both the business contract and the consumer, as well as the terms and conditions, provisions, and other necessary elements that every contract has. 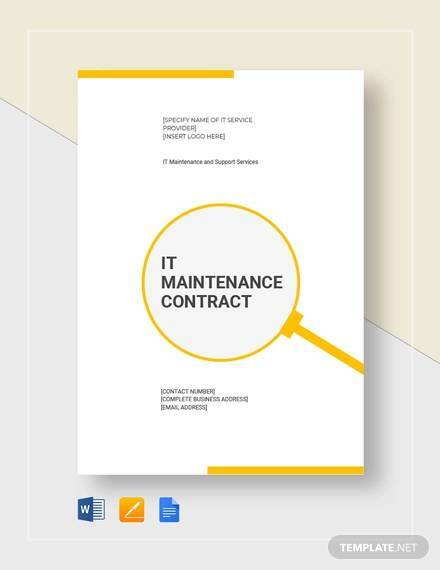 In this article, you will be able to read more information about the definition of a maintenance contract, as well as its benefits, the steps for creating your own maintenance contract, and the various types of maintenance contracts that can be used. 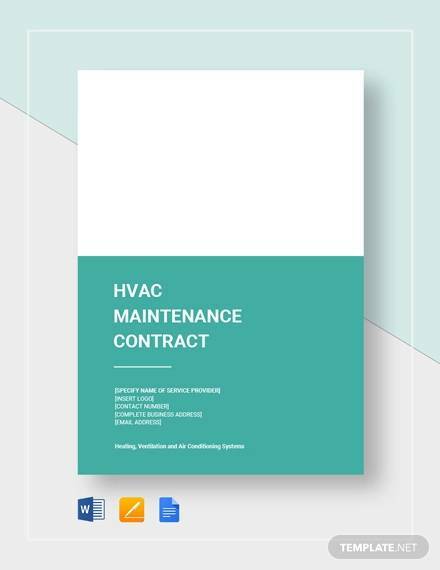 Should you need templates and samples, you will find different types of maintenance contract requirements in this article that you can download to help you create one. 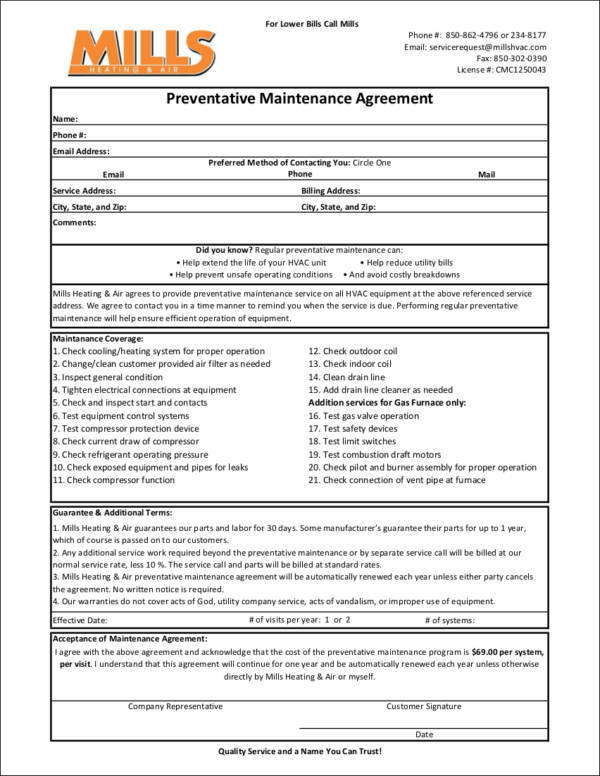 A maintenance contract is a written legal document that is used when two parties enter an agreement for the maintenance of a particular equipment, property, building, appliance, or vehicle. 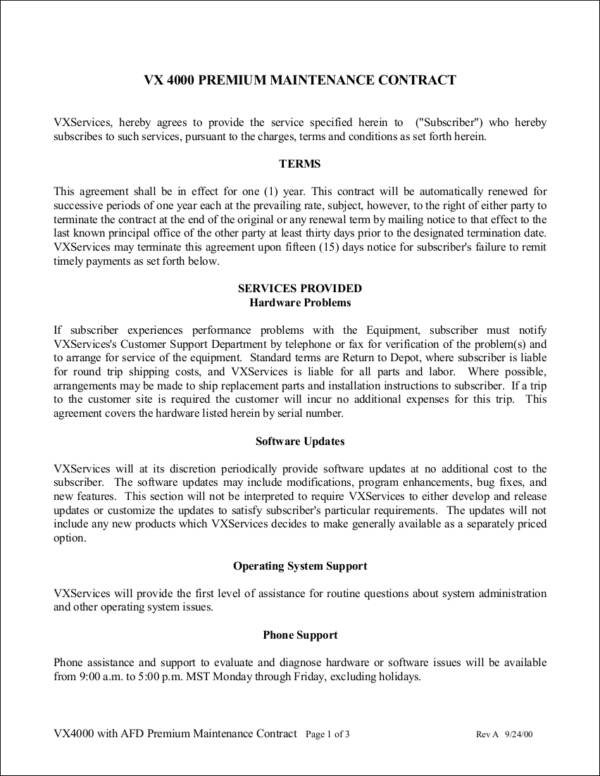 A maintenance agreement is used to clearly state the agreement that has been agreed upon by the consumer or customer and the service provider. For example, when an individual purchases a particular appliance from a store or business, a maintenance contract will indicate that the business needs service provider agrees to maintain the product or item that the customer has purchased for a specific period of time. A maintenance contract can help protect the rights and interests of both the customer and the business. Since contracts are signed by both parties, it can provide all the information that has been agreed upon ever since the start of the purchase transaction or the service acquisition strategy. Maintenance contracts outline the terms, scope of Work, and conditions that should be honored by the parties involved in a transaction. It is important for maintenance processes to be kept to a minimum so customers will be well guided on what to expect should issues or problems on maintenance, repair, or exchange occur. 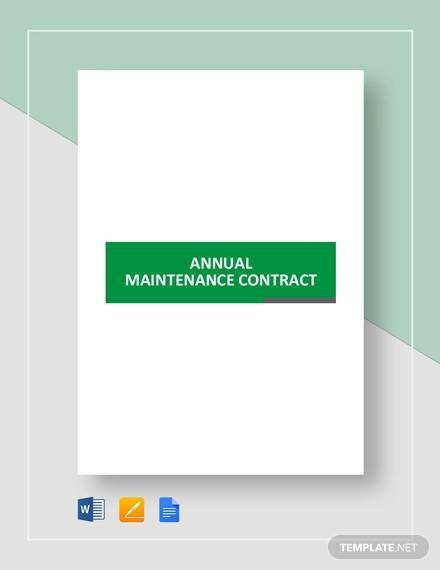 Maintenance contracts contain the details about the entirety of the maintenance provision. Most purchases, especially those that are related to items and products, are only up for maintenance within a particular time period. The usage of maintenance contract samples come in very handy when a business needs to prove that they are not already responsible for any material maintenance after the contract validity has already expired. 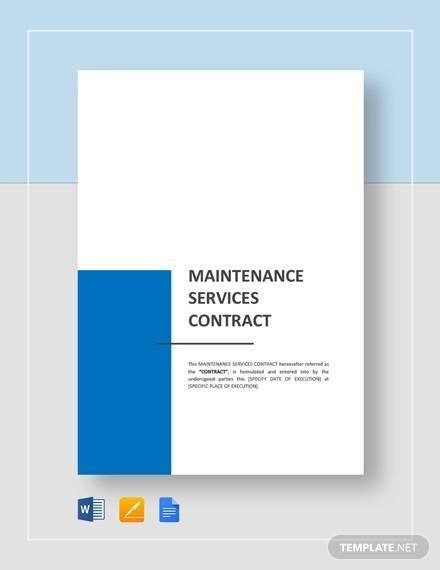 Maintenance contracts can easily specify the nature and kind of maintenance processes that a customer is entitled to. There are different kinds of maintenance works and services, which is why it should always be cleared out on what kind of maintenance it is that is included in the purchase of the customer. 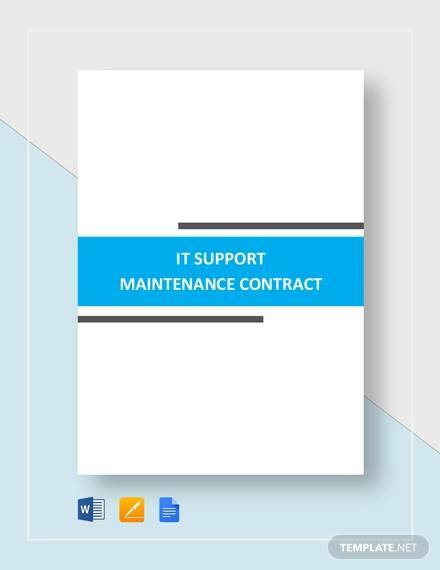 Maintenance contracts allow full understanding of the support that a company can provide when it comes to fixing troubles or parts of the item being purchased by the customer. 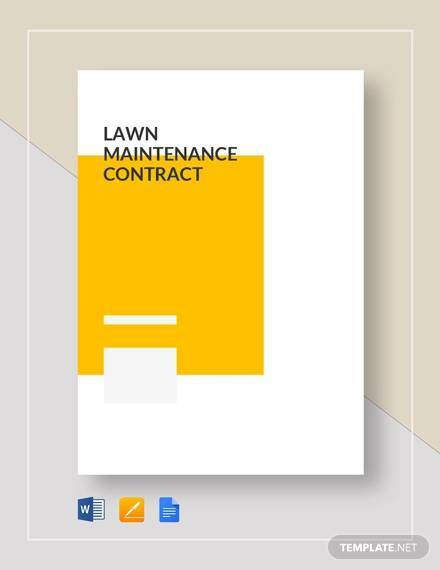 There are also times where maintenance contracts can be used in leasing contract transactions where the subject matter is about the maintenance support of the business or the property in relation to the area being rented by a tenant. Be clear with the kind of maintenance that is included in the contract or agreement. It is very important for you to make sure that the business and the customers are on the same page when it comes to the identification of the maintenance services involved in the transaction. This will help set proper expectations. Provide precise information about the parties that will be under the terms of the contract. Basic information about the business, the customer, and the purchase should be present in the maintenance contract to provide clarity about specific matters concerning the entities. List down the description of all the maintenance services to support the initial financial statement that you have placed in the document. This includes all the processes that can be given by the business in relation to maintenance and repair. Create the timeline example or any other issues where time duration is essential to be considered. As specified in the initial statements, maintenance works can only be done for a particular time period unless stated otherwise. Properly identifying the maintenance validity can help the business be protected from abusive customers whose maintenance claims are invalid or based on expired contracts. Ensure that you will also provide a concrete description of the items present within the transaction. 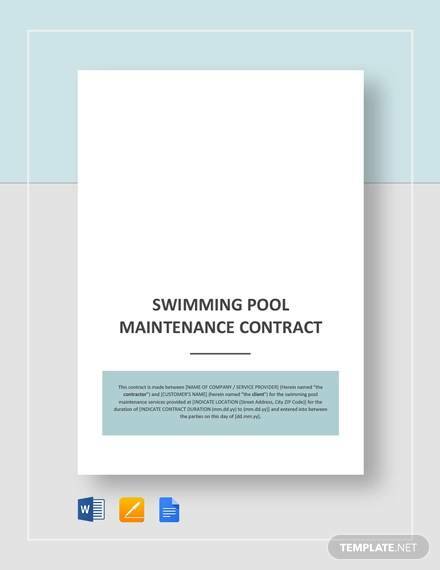 Maintenance works can only be done to the materials or spaces present in this maintenance contract clause. Provide additional information when necessary. This can be done if there are more agreements that transpired aside from those that are basically found in a simple maintenance contract. This will depend on what the business and the customer have talked about. 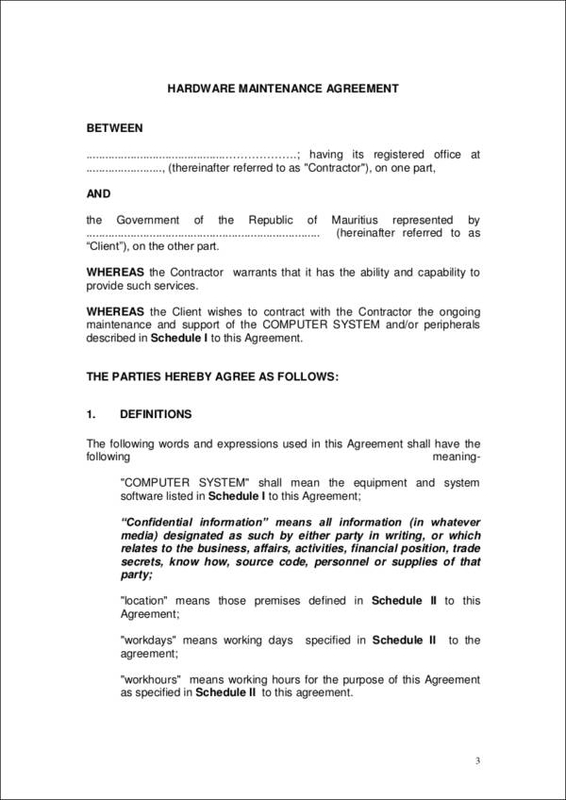 Create a clause that states the authenticity of all the information in the maintenance contract. This will ensure parties that all of them are well aware of the content of the agreement and that we are also willing to abide the contract terms and rules. 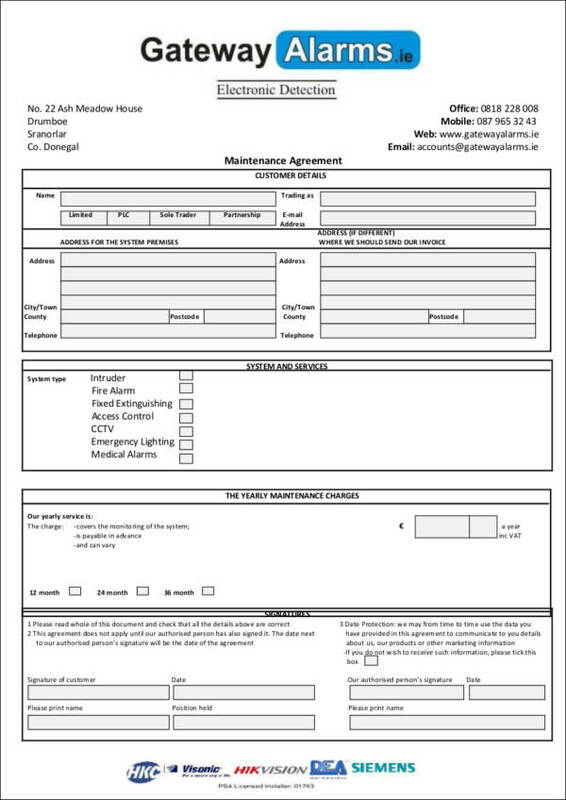 Once all this information is placed in the maintenance contract, ensure that the signature of all the parties is affixed on the bottom part of the document. 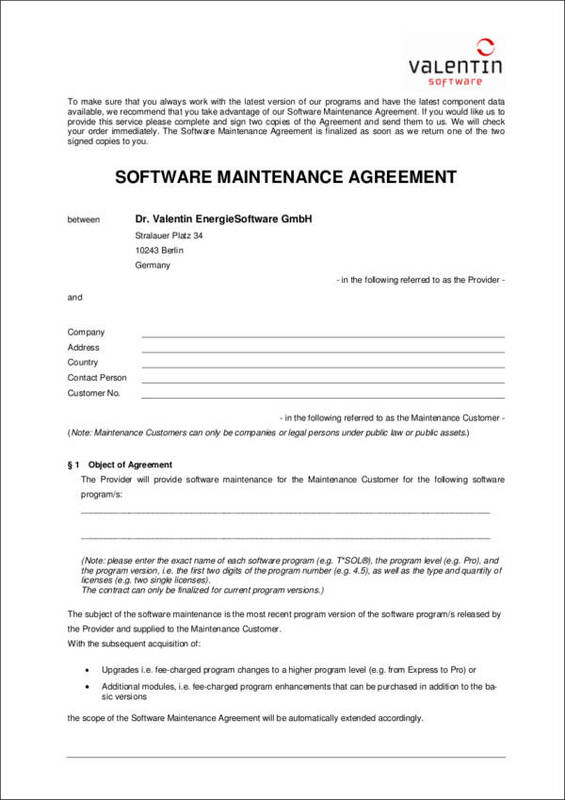 In addition, if you need a template for creating your maintenance contract, you can download the templates and samples that are available in this article to make it easier and convenient for you when creating one. 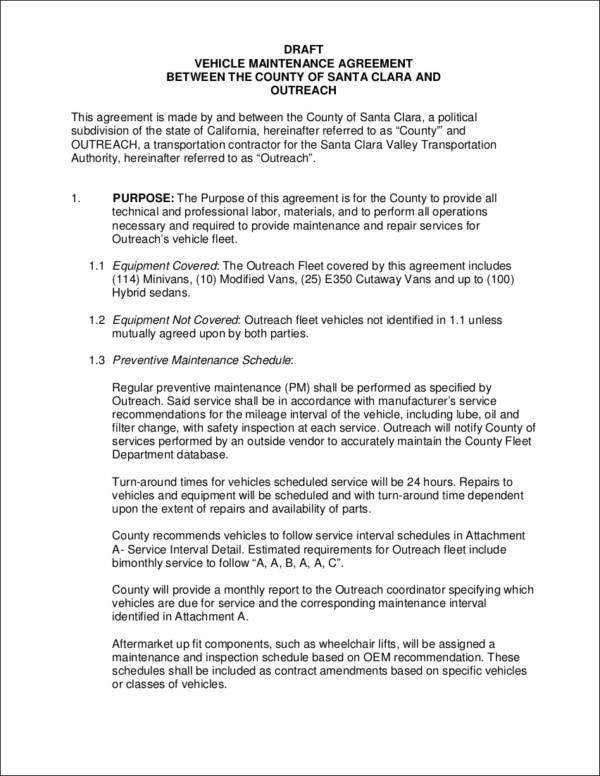 When you purchase a new vehicle, it usually comes with a maintenance contract. The business provides maintenance, repairs, and other necessary fixes that the car may need. This saves the customer or client from paying the costs of maintaining a vehicle, which can become costly depending on the damage. It has become a standard as well for owners of used cars to extend the warranty deed or agreement that will make them eligible to receive maintenance and repair benefits for a particular period of time and with a lower fee. 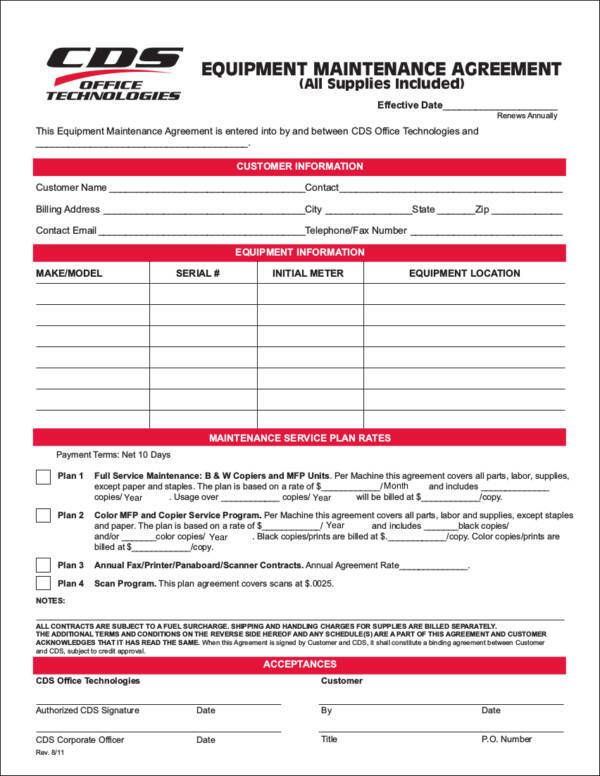 An equipment maintenance contract is also a useful document that is used when a customer purchases heavy equipment or machinery. This assures the customer that the equipment that he/she has purchased will be maintained or repaired by the service provider should the equipment lease need repairs for a specific period of time depending on the agreement. Property owners that need to have a particular property contract maintained, whether it is a real estate property, rental property, or a piece of land, can contact a company that provides services that offer maintenance. This is especially important when an owner doesn’t have the time to manage and maintain his/her property. This is when a property maintenance contract is useful indicating that the business has agreed to maintain the property, which includes the repair of broken toilets, tubs, electrical and plumbing services, and so on. A property owner can save money since it is a fixed rate. Consumers who purchase appliances like an oven, a refrigerator, and other home appliances need to have an appliance maintenance contract to protect the consumer should the appliance break down or will need repairs in the future. 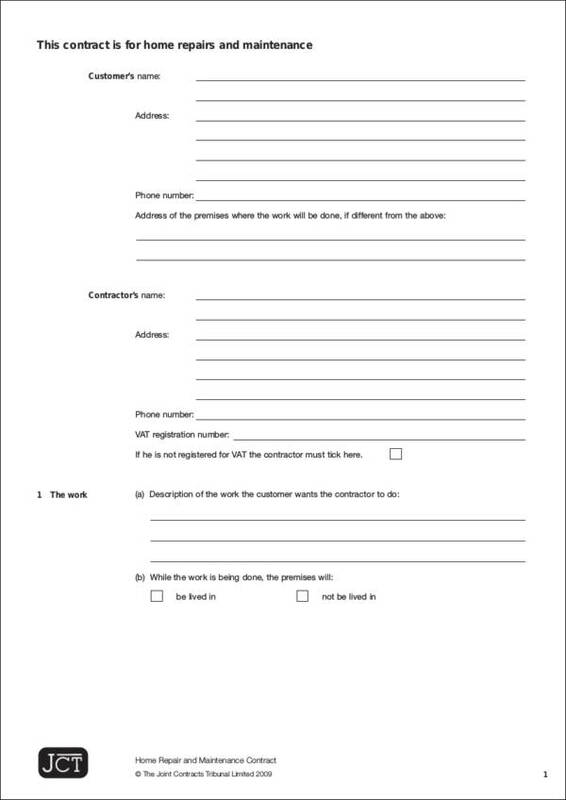 Additionally, aside from the maintenance contracts available on this page, we also have other types of contracts that you can download such as an employment contract, wedding contract, and a land contract. You can browse through our selection of contracts, plans, letters, and many different types of templates and samples on our website.